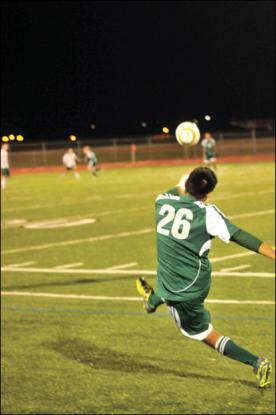 Soccer games involve many kicks. When a referee stops a soccer game due to a foul that has occurred, a free kick will most likely be awarded to the team that was fouled on. There are two different free kicks the referee is able to award; a direct kick or an indirect kick. There are a few guidelines that are the same for both types of free kick, direct or indirect. In both kicks, the soccer ball has to be stationary and kicked from the spot where the foul occurred. The kicker is not allowed to touch the ball again until another soccer player has touched it first. A direct kick is awarded if a foul has occurred in the goalie box and allows the team that was fouled to take a shot on goal. This usually means the player that was fouled gets to take a one-on-one shot against the goalkeeper and all of the other players must remain 10 or more yards away until the ball has been kicked. Once the kick has either been blocked by the goalkeeper or scored in the goal, the game is able to resume. Indirect kicks are awarded if a foul has occurred outside of the goalie box and are considered less severe than fouls that result in a direct kick. Such offenses that award an indirect kick include offsides, being in the way of a goalkeeper releasing the ball, dangerous plays, and infractions in substitution. The only way a team is able to score from an indirect kick is if the ball is touched by one or more of the kickers teammates before it goes into the goal. If the soccer ball goes into the goal before it is touched by another player it immediately becomes a goal kick. During an indirect kick, all other players must remain 3 or more yards away and wait until the ball is kicked before resuming.